Are you serious about writing? Are you looking to be a successful freelance writer? Are you hoping to get your book manuscript published? You need pick up the 2015 Writer’s Market guide. What is it? It is almost everything you need to be a successful writer. The first part of the book is a collection of short chapters by experts in various areas. It touches on things like queries, blogs, social media, financial tips, writing tips, building platforms and so much more. Just that would be worth the price but it has much more. It has a comprehensive list of book publishers that gives you all the information you need. It also has (and this is my favourite part) a list of magazines and other publications. It tells you the types of articles they are looking for, what they pay and who to contact. I can’t imagine being a freelancer with out it. 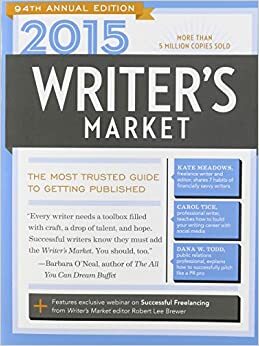 Do yourself and pick up a copy of the 2015 Writer’s Market in paperback (USA) (Canada) or in Kindle (USA) (Canada).